Fruits contain a variety of natural sugars, including glucose, fructose, sucrose, galactose and maltose. These sugars are digested by your small intestine, which then releases them into your bloodstream. Fruits are generally rich in fiber, vitamins, minerals and antioxidant compounds, as well, which is why the U.S. Department of Agriculture recommends that women consume 1 1/2 to 2 cups of fruit each day. 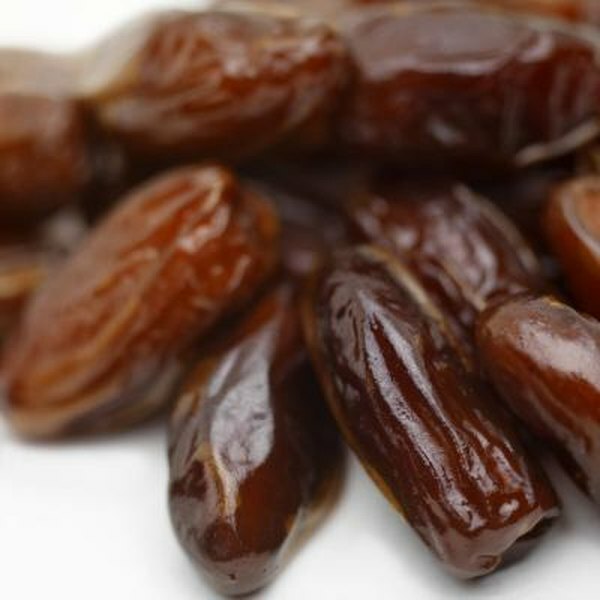 Raisins and dates provide large quantities of natural sugars in a concentrated form. Because raisins are dried and fresh dates have a relatively low water content, both are fairly high in sugar. You'll get almost 70 grams of sugar from a 1/2-cup serving of dates, according to the USDA. The same amount of raisins supplies just under 60 grams of sugar. Both fruits are good sources of fiber and potassium. Bananas prove one of the richest sources of natural sugars, with approximately 34 grams per cup, according to the USDA. One large banana equals approximately 1 cup. The natural sugars in bananas include sucrose, glucose and fructose. Bananas are also a good source of potassium, dietary fiber and vitamin C.
With approximately 29 grams of sugar per cup, fresh grapes are a rich source of the simple sugars glucose and fructose. Although grapes are relatively low in fiber, potassium and vitamin C, they're a fairly good source of antioxidants. Mangoes are a sweet, juicy tropical fruit that deliver approximately 35 grams of sugar per average-sized specimen, or about 28 grams per cup. Mangoes also contain significant amounts of vitamins A, C, E and K, niacin, potassium, phosphorus and dietary fiber. Enjoy them plain, add them to fruit salad or stir them into plain yogurt. Cherries come in several sweet varieties, including Bing, Chelan and Rainer. Sweet cherries contain high concentrations of natural sugars, including glucose and fructose. One cup of sweet cherries delivers right around 20 grams of sugar, according to the USDA. Sour cherries contain less sugar, with no more than 13 grams per cup. A 1-cup serving of chopped pineapple has about 16 grams of sugar, mostly in the form of glucose, fructose and sucrose. These tropical fruits are high in vitamin C and a good source of vitamin A, manganese, potassium and dietary fiber. The UDSA reports that apples provide an average of 12 grams of sugar per cup, including fructose, sucrose and glucose. A medium-sized apple is equivalent to a 1-cup serving of fruit. Apples are a good source of fiber and contain moderate amounts of vitamin C and potassium. Apple juice is significantly higher in sugar, with 24 grams per cup. Foods & Nutrition Encyclopedia; Audrey H. Ensminger, M.S., et al.